In 1849 Germain Mott Cossitt with his brothers Newton Cossitt and Levi Cossitt moved to Canada and settled in St. Catherines, Ontario where they engaged in the manufacturing of fanning mills and straw cutters as specialties. Four years later they moved the business to Smith Falls, Ontario and the company became known as G. M. Cossitt & Bros. SMITH FALLS AGRICULTURAL WORKS. In 1858 they commenced the manufacture of a full line of agricultural implements. 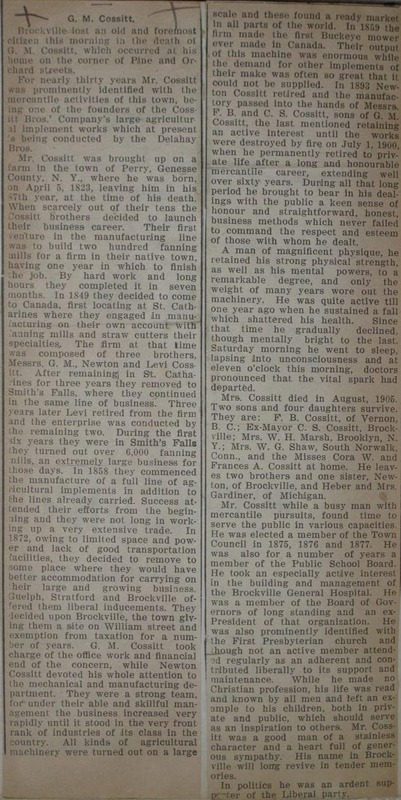 In 1872 they moved the business to Brockville, Ontario mainly because of a lack of good transportation and limited manufacturing space. By 1890 the firm employed 125 men and manufactured and sold a wide variety of horse-drawn farming machines and implements. The factory had its own foundry for forging the parts and maintained a large stable for horses which drew its wagons and carts. At its peak, the company employed between 300 and 500 men and had nine branch offices across Canada with dozens of small agencies that carried its products. It introduced the first self-binding wheat harvester, the McCormick Bindlochine. This efficient harvester could be drawn by one span of horses. It cut, sheaved and bound the wheat, and was equipped with a throwing arm which would deposit the bound sheaves in a trailing wagon. On July 1, 1900 (Dominion Day) a fire destroyed the plant with losses estimated at $125,000. The Cossitt brothers never laid off a single man, but kept them on salary until replacement buildings were erected. The factory never returned to full production, but only turned out parts for Cossitt equipment already in use on Canadian farms. The factory closed permanently in 1906. At the time of closing, Massey Harris bought several patents and continued manufacturing some of the Cossitt equipment. Copyright © 2008 & 2011 Cossitt Family Association Inc. All Rights Reserved.